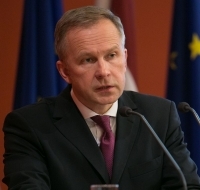 RIGA - The corruption case against Bank of Latvia Governor Ilmars Rimsevics is likely to reach the prosecutor’s office is a few months’ time, Jekabs Straume, head of the Corruption Prevention Bureau (KNAB), said in an interview with Latvian Television this morning. The KNAB chief indicated that investigators are working according to the plan and that there are no indications of any delays in the investigation process. “The initiator of the process, the investigator in charge and the supervising prosecutor have voiced confidence that the case will reach the prosecutor’s office for starting criminal prosecution,” said Straume. The KNAB chief also said he did not feel any political pressure regarding this case. As reported, the Corruption Prevention Bureau is probing Rimsevics for soliciting and accepting a bribe worth at least EUR 100,000. Rimsevics, who was released from custody on bail, has been banned from performing his office duties, approaching certain persons and leaving Latvia. Rimevics, however, has vowed not to stand down as Bank of Latvia governor. KNAB has said that the criminal probe against Rimsevics is unrelated to the credit institutions currently operating in Latvia, the U.S. Treasury’s report on ABLV Bank or potential court action between Latvia and Norvik Banka. It has been implied, though, that the case might be related to the insolvent Trasta Komercbanka, which KNAB and Rimsevics neither confirm nor deny. Rimsevics insists he is innocent and therefore will not step down as the head of the Latvian central bank. He said that the accusations against him was a retaliatory action from ABLV Bank and other banks serving non-residents.